In one sentence: Reedah is a replacement for Google Reader that lets you use existing feed reader apps and synchronize your RSS feeds between devices. In more technical terms, Reedah implements most of the Google Reader API. If an existing reader app (such as Feed Demon) is pointed to the reedah.com web site rather than google.com, the app should continue to work without interruption. Reedah also has a web-based interface. You want to keep your RSS feeds synchronized across platforms and devices. You want the freedom to choose how to read your feeds - not be locked to a particular app or browser. Maybe you even want to do this on a minor platform like WebOS or MeeGo. You may not want or need the 'features' being pushed by other services. Can I import my Google Reader data? Yes. You can import an OPML (XML) file or a zip file you downloaded from Google Takeout. This can be done at any time, even after Google Reader has been shut down. Can I read my feeds on the web? Yes. Check out a screen shot of our web-based reader. It has most of the Google Reader features, including: keyboard shortcuts; infinite scrolling; automatically marking aticles as read when you scroll past; automatically updating the unread count without refreshing the page; list and detail views; and 'send-to' (Instapaper, Evernote, Pocket, ...). Starred articles, kept-unread, mark-read and tags all work. You can search your feed content. 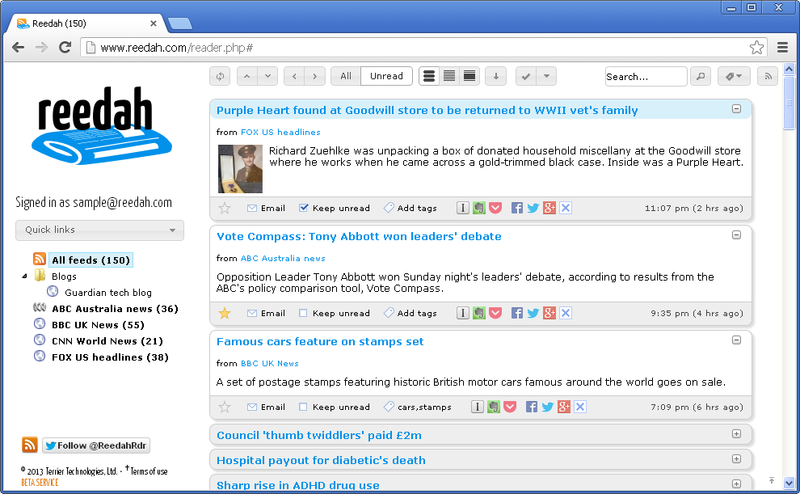 We've also added some things Google Reader didn't have, like the ability to collapse or expand articles. Which existing apps work with Reedah? We have modified versions of FeedDemon v4.1 (Windows), RSSOwl (multi-platform), gReader (Android) and gNewsReader (Symbian & MeeGo) that work with Reedah. Most of our API testing was done with Feed Demon and gNewsReader, so we think they work quite well. We've compiled some instructions for Windows (FeedDemon) and Android (gReader) to point you in the right direction. We're not making versions of apps available for download due to copyright concerns. Also see the section "My apps don't work with Reedah". My apps don't work with Reedah, what can I do? Ask the app developer to make a version that works with Reedah. Modify the app to work with Reedah yourself. Generally this means doing a find-and-replace with a hex editor to change occurrences of google.com to reedah.com (see our Developers page for more info). Download a version of the app that someone else has modified. Only do this if it is legal, and be sure to scan the downloaded file for viruses and malware. Use proxy- or firewall-based redirection so that traffic to google.com is redirected to reedah.com. This approach should work with all apps, but is beyond the capability of most users. Plus, there is a risk that other Google tools will stop working. Will you charge for Reedah? We're currently providing Reedah as a community service, and we're skeptical it will grow to the point where cost becomes a serious issue. We certainly don't see it as a money-maker. That said, we don't have deep pockets like Google, so if Reedah grows beyond our expectations we'd need to defray the cost somehow. In that case we'd first try a 'soft' approach (e.g. donations). Does Reedah do everything Google Reader did? Not quite. Most notably, we don't have a 'recommendation engine'. We don't offer the ability to share/like articles within Reedah, although we do offer social features like sharing via Facebook, Twitter, Tumblr, etc. Non-Latin character sets have not been tested. Our immediate goals are to get more apps working and build a mobile site. If you are a developer, please see our Developers page. If you want to contact us for any other reason, you're welcome to contact us on Twitter @ReedahRdr, or email us: talk2us@reedah.com.